Tmart Enterprise Pte Ltd is the Exclusive Distributor of EarthCalm products in ASEAN, Taiwan, China & South Korea. Announcing the arrival of our exciting new products. Multi Coloured Child Bracelet for children and young adults are now available ex-stock. New shipment of INFINITY Home EMF Protection System and Black Sanctuary Band had arrived. Protect Yourself from EMFs by Grounding to the Earth’s Electromagnetic Field. Effectively you will be earthing instantly without pads or wires but wirelessly at the speed of light using EarthCalm's Mirror Resonance Technology to connect you to the earth's healing energy via resonance constantly even while you are on the move or in the air many miles above the earth. Concerned about the EMFs from your smart meter, your cell phone, or your laptop and other wireless devices? You don’t have to give these up! You can protect yourself from EMFs with EarthCalm products, which allow you to resonate to the Earth’s healing field. 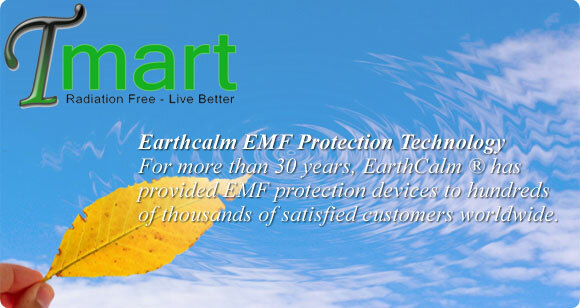 For more than 30 years, EarthCalm® has provided EMF protection devices to hundreds of thousands of satisfied customers worldwide. EarthCalm Mirror Resonance Technology amplifies resonance with the Schumann Resonance (Earth’s natural electromagnetic field). This ongoing, embracing field sustains, heals and activates the deepest potentials of your nervous system. Mirror Resonance Technology consists of hundreds of handmade miniaturised circuits or antenna that mirror and, like an FM antennae on your radio, amplify our ability to receive and be healed by the living presence of the earth. Protected Zone Technology (PZT), which creates an additional protective zone around the wearer. PZT utilises the principles of an electromagnetic transformer to create a voltage fence around the wearer that offers maximum personal protection and gives enhanced energy, strength and endurance. This secondary EarthCalm technology is only available in the Sanctuary Bracelet and Sanctuary Band. Connection to the Earth’s Electromagnetic Field: EarthCalm’s Mirror Resonance Technology enhances your connection to the earth’s electromagnetic field–a connection essential for your optimal health. This connection or grounding dissipates the unnatural and biologically-meaningless currents that enter your body through man-made EMFs. Relaxation of the Nervous System: As grounding begins, you may initially experience a brief moment of dizziness or even a flush. This is due to the increased blood flow to your brain, as the constriction caused by EMFs is released and your nervous system begins to relax. When this dizziness or flush normalizes in a few moments, if you are like most people, you will experience a sense of calmness, warmth and peace. A new study has been completed on the Infinity Home System by Glen Rein PhD of Quantum Biology Research. Dr. Rein tested the effects of home electricity and microwave radiation (from a smart meter and wireless router) on human DNA, both with and without the EarthCalm Infinity Home System installed. Research results showed that the Infinity Home System completely reversed the harmful effects of radiation on human DNA. GET PEACE OF MIND WITH 30 DAYS MONEY BACK GUARANTEE. GO TO INFINITY PAGE FOR DETAILS. A new research study in March 2014 by Glen Rein PhD of Quantum Biology Research tested the effects of RF radiation from a cell phone on human DNA, both with and without the Quantum Cell attached to the phone. Using an iPhone3 in both standby and receiving modes, the study showed that when a Quantum Cell was attached to the phone, the radiation no longer inhibited the electrical conductivity of DNA as it had without the Quantum Cell, indicating a complete and statistically significant reversal of the harmful effect of the cell phone. The results also indicated that placing the Quantum Cell on the cell phone in standby mode not only brought conductivity values back to control values, but further increased them by nearly 40% above normal. Want to know where the EMF hotspots are in and around your home? Order a home EMF radiation survey for $300 with high quality professional instruments and we will waive this charge if a purchase of any combination of products having total value in excess of S$500 is made in a single order during the visit. (Service only available for homes within mainland Singapore) You may contact us by email or phone from details in the contact us page. Most people had found relief using the Earthing by Resonance approach, but some may require a stronger protection. For these people, we suggest adding a 2nd line of defence by adding a shielding solution. We now have these products available to help you close up on the complete EMF Protection solution. The test we had conducted with these products were amazingly effective. Order any combination of products in excess of S$500 and we will demonstrate the shielding or earthing effectiveness in your own home (Singapore only) In addition, you can also add an isolation approach for your bedroom with a demand switch so that your sleeping area will be completely isolated from all the LF radiation. Please lookup the EMF Shielding and EMF Detection & Control page of this website. Disclaimer: The products and/or technologies listed on this website are not FDA-approved and are not intended to diagnose, treat, cure, mitigate, or prevent any disease. Please consult your physician or health care practitioner for any questions about EMFs and your health.